Screens, Yes! screens. I believe that Screens are taking over our lives it is getting worse and worse in the modern world. Television screen ,Mobile Phones, Tablets, Handheld games consoles, computers even in our cars. The time we spend in front of screens is shocking! either for work reasons, socialising or leisure. Screens serve as a portal taking us form reality and transporting us somewhere immediately however with the amount of time we spend in front of them they are sucking the life out of us without us even knowing it. 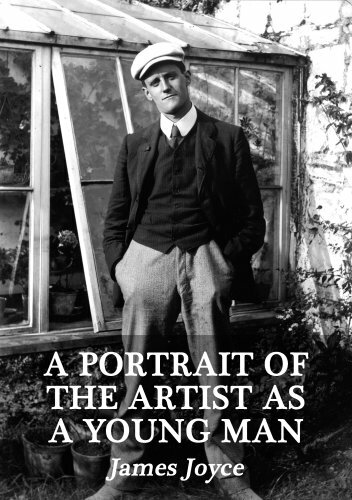 James Joyce the author uses a combination of modernism and realism which makes it hard to actually know what is going on at any point in the book. He also repeats word of word some parts which adds to the confusion and he doesn't use speech marks to show conversation, he uses dashes which is supposed to make it seems more real because you don’t read it like someone is talking you just read it and it flows in to everything else. The main aspect of his writing that makes it so difficult to read is the constant stream of consciousness from the main protagonist which is Stephen Dedalus. Its written in third person narration but from Stephen’s perspective and he chain of thought is mingled in with reality and what is actually going on. "Every word of it was for him. Against his sin, foul and secret, the whole wrath of God was aimed. The preacher's knife had probed deeply into his disclosed conscience and he felt now that his soul was festering in sin. Yes, the preacher was right. God's turn had come. Like a beast in its lair his soul had lain down in its own filth but the blasts of the angel's trumpet had driven him forth from the darkness of sin into the light. The words of doom cried by the angel shattered in an instant his presumptuous peace. The wind of the last day blew through his mind, his sins, the jewel-eyed harlots of his imagination, fled before the hurricane, squeaking like mice in their terror and huddled under a mane of hair." It compares writing and designing as two things which are very similar. This is because when designing you need to designing something that others would find interesting to use same as when writing you need to write in a way that is interesting and easy to read. "to think of the problem of designing something that people will find understandable and easy to use as the same problem as writing something that other people will understand and find easy to read." It also emphasizes on how important empathy is in writing, taking other peoples views into consideration. " Nothing can be worse than a writer or designer who thinks everyone else is just like them"
It also reinforces something i learnt in my writing design lecture. "Obscurity is often thought of as an essential ingredient in academic writing. Someone who writes clearly is viewed with great suspicion. Basically, the idea appears to be that if the writing is easy to understand, then the ideas beneath them must be inferior: simple writing reflects a simple mind." The very precise and clear nature of this poster makes it easy to sense the message right from the very first glance. The first thing that came to mind after seeing this was "moving forward looking back". 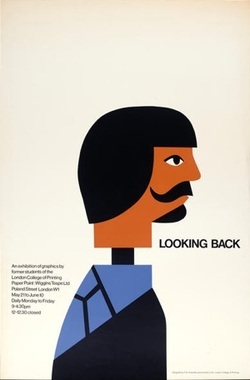 This is one on my favourite Tom Eckersley posters, It was designed to promote an alumni exhibition in the London college of printing. Eckersley does this well using a young looking male figure who looks rather futuristic in his attire and weird but fancy hair cut similar to some characters in star trek . Eckersley is trying to depict London college of Printing's alumni s as young, futuristic and intelligent individuals, who are going places in by showing them in such an interesting way. I find the characters handle bar mustache with a nicely shaped goatee particularly interesting. It brings a dimension of cool to the poster using such funny but sophisticated facial hair. Perhaps men with interesting well groomed facial hair were more successful at the time and his unique facial hair was a symbol of success similar to the Cornell Kentucky of KFC. It also has the text looking back in a rather large font, this is a clever tool to immediately draws attention to anyone looking at the poster. This poster shows that no matter how far you go you can never forget how you got there. for seven days and seven nights." How many products claim to be innovative, game-changing, revolutionary? And of those, how many truly are? The iPhone has become a rather clichéd example, and for good reason – it transcends industries as an example of holistic innovation in a saturated market. The automotive industry has been lacking such brave rethinks for decades – adding apps to infotainment systems isn't going to suddenly engage with a whole new audience and offering myriad customization options, while attractive and lucrative, is little more than window dressing – yet there is a new, notable exception on the block. Not since the Citroën DS was beamed down in 1955 has one car embodied so many technical innovations, in the mainstream at least. Indeed the BMW trumps the goddess by using an advanced electric drivetrain, while the at the heart of the beautifully avantgarde Citroën sat a clattery old pushrod engine, where a turbine-smooth rotary engine was intended to reside under that voluminous hood. The two cars are similar in their constructions, both using a stressed frame from which all the mechanicals and body panels are hung. But while the DS was mainly steel (save for its fiberglass roof), the i3 is the first mass-market composite car, its thermofomed plastic body panels bolted to a carbon fiber reinforced plastic frame, with its battery packs and crash structures housed in an aluminum chassis. The i3's aesthetic is true to its structure; not appearing hewn from solid – as has become the industry ideal – but formed of a number of components fastened together. Pull open the light doors and the bare CFRP frame reinforces the point, while the lack of B-pillar takes full advantage of the strength of carbon. Its coach doors – accessed via a beautifully solid-feeling aluminum handle – reveal an interior more akin to a collection of furniture arranged in a room; the tastefully-upholstered armchairs, flat-screen TV and an unfinished wood coffee table of an IP wouldn't look out of place in any modern home. When was the last time we could say that about the internal trappings of a car? It's not unlike a conventional car to operate however, if anything it's simpler. Thumb the start button on the transmission selector to the right of the steering wheel and its illuminated border changes from red to blue. Twist the larger trigger-shaped rocker switch forward (pull towards you for reverse) and you're good to go. Like all EVs it's a rather eery experience thanks to the lack of noise and the stepless acceleration. But while in many others that means you hear more of the unpleasantries usually masked by the engine such as the suspension working or the structure creaking, the immensely strong i3 remains one of the quietest, most refined cars imaginable. Combine this with its lounge-like interior and higher-than-average H-point and the result is a car that promotes a relaxed, stress-free gait. It would be interesting measure the heart rate of an i3 driver verses that of a conventional car. That's not to say this is some plodding eco car. With an unexpected level of acceleration instantly available it's also a great urban traffic hustler, catching many people by surprise as we negotiated the early morning central London commute. Its narrow wheels and lack of transverse engine lend it an exceptionally tight turning circle too. The only real obstacle to this is the size and shape of the A-pillars that create major blind spots when pulling out of junctions, entering roundabouts or rounding corners. It's a real oversight for such an urban-oriented car. A Citroën C4 Picasso for example offers a far more panoramic, unobscured view ahead. On Choosing writing design as a CTS Option i did not know what to expect . Writing Design seems like such a vague concept, would i be writing about how to design things or writing about the design of things. The whole concept was confusing to me, however i eagerly look forward improve my writing skills and this seems like the perfect means to do so. So far i have learnt that writing design is basically writing about anything and exploring the vast amount of ways in which that object or topic can be viewed an written about. On the very first lecture i remember Mark saying when you write about something write about it like its the first time you have ever seen it. 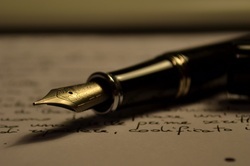 It gives a new exciting dimension to writing as a whole.